Thanks to Fred Crawford, we have a photo of the Blue Damsel house band- The Rock Bottom Boys. Technically, this season it has been Maren Wing and The Rock Bottom Boys. From left to right, we have Troy Lorenz on the stand up bass fiddle, (world famous? )guest guitarist Jim Cox sitting in on accoustic guitar, Josh Wing on fiddle and vocals, Maren Wing (Troy’s wife and Josh’s sister) on accordian and vocals, and Keith on lead guitar. This was a little session we did mid September on a wonderful evening after a great day of fishing. We only have two weeks left this season to try and get a video/audio put together, but we are working on that right now. If it happens, we’ll post the link here. We just met David this year, but he came out twice so we got to know him pretty well. We just found out David took his last fishing trip-one he won’t come back from. 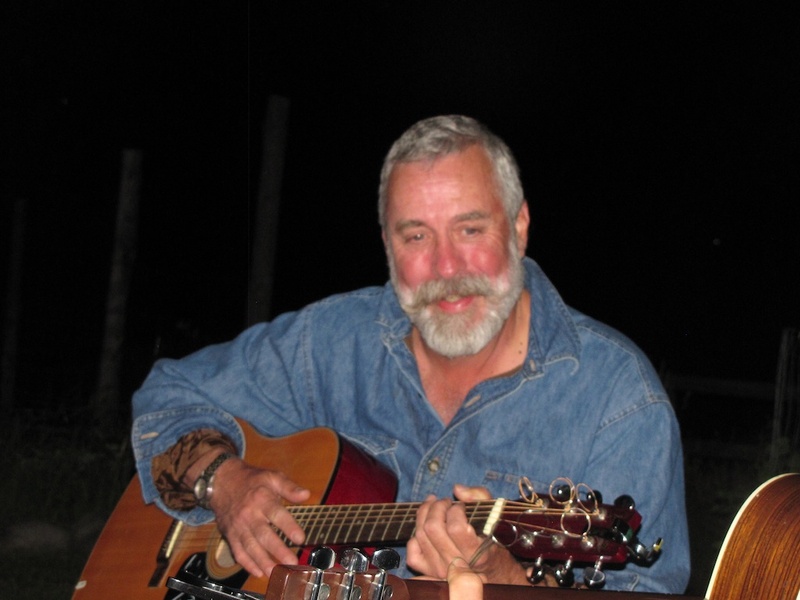 We are so sorry to hear that and so very glad to have known you and honored to have fished with you. Goodbye buddy-from all the staff and guides. This is not the typical conservation story, but this fish was saved by Kirk Kanady, one of Keith’s lodge partners. Thanks Kirk! Any of you who have been to the lodge in the past several years know the trout sculpture displayed on the main level. This sculpture, by Missoua artist Jonathan Qualben, has been on display here for 4 years. Jothathan found a buyer for this, the last of his 8 foot trout sculptures, and told us he would make another one if we wanted to keep our old friend. And Kirk “threw down” and bought the trout! Those of you who have been here this summer knew that we were concerned about being able to keep the fish and may be relieved to know that the big old trout stayes right where it is. Thanks again Kirk! 7 o’clock. Pitch black dark back at home in my native Alabama. As I sit here and write, the images explode in recent memory. Deep diving Gorges lined with evergreen spruce and ponderosa pine, and river banks teeming with fresh hatchlings coming off the water, precisely at this same time that I am sitting in the aforementioned pitch black dark. Don’t get me wrong , I love being at my home and I love my state, but over the past week the Blue Damsel Lodge outside of Missoula Montana provided me with some of my fondest memories and experiences to date as a Fly Fisherman and Outdoorsman. We arrived at the Blue Damsel early on our first day, ensured by our host Keith that we would not be intruding by getting there early. After a brief tour around the lodge, which was immaculate, we got a special little lunch packed by their amazing Chef and all around renaissance man Josh and we headed out for a little self guided fishing on Rock Creek. I had done my homework leading up to our trip and thought I had seen some of the beautiful vistas that rock creek could offer, however I was amazed as we trekked through the clear waters running slightly higher than normal at the authentic beauty of the river and surrounding mountains. A few rising fish were our first sign that there was a nice hatch occurring and subsequently we tied on what we thought to be a good match. Upon further inspection we realized that there was a large number of golden stoneflies hatching and the fish seemed to be turned on to them. On went a rubber leg yellow stimulator and the fish started to fall victim to our offerings. We worked our way upstream and ended the day with several nice bows, browns, and cutts. When we returned to the lodge we were greeted by the friendly people at the lodge and we got our fill of wonderful food and glorious tales of fishing greatness to come on our float trip the next day. Sunrise the next morning brought about an eagerness to get out on the water, but not before another wonderful meal prepared by the lodge staff. We were met at the gathering place by our guide for the next two days Adam Spenner. Immediately I knew that Adam and I had a similar mindset as it pertained to Fly Fishing. Over the course of the next two days my fiancé and I experienced some of the best fishing I have ever been privileged enough to be a part of. Adam was a terrific guide and his knowledge of fishing was more than adequate to put us on the fish. Moreover his skills as a rower on the driftboat were downright amazing. I have been on a few driftboat float trips before and Adam takes the proverbial cake for the best driftboat guide I have had. Our first day on the Blackfoot river was spectacular filled with lots of dry fly action and good solid cutts , bows, and brows all in the 12-16” range. I was so thrilled for my fiancé to be able to experience the glorious vistas offered up to us by the blackfoot as well as fast and furious fishing action. In fact as much as I hate to admit it, she outfished me on that day! Overall 40+ fish in a day, wonderful companionship, and breathtaking scenery made for an amazing day, but what was to come was even more of a thrill. Our second day on the blackfoot began similarly to our first, a great breakfast at the lodge followed by a drive to meet up with adam to head to the river. This time we went much higher up river and started our drift surrounded by ospreys and even more spectacular scenery. Adam decided that we would target the “mack daddys” by going deep and slow, dredging some larger bugs on the bottom. That strategy immediately payed unforgettable dividends when I hooked into and landed a 17” Bull which immediately inspired me to enjoy a victory cigar. I never thought I would have the chance to catch one of these beauties and reality was setting in as I kneeled in the river, fish in hand, surrounded by the ubiquitous beauty of the Montana wilderness. The day progressed on wonderfully as we witnessed several eagles fly over head and brought fish after fish to the boat, including this beauty of a 19” brown. After several hours on the river we made our way down to the takeout saddened to be departing from our guide and new found friend but full of gratitude and for his effort and conversation. Overall the day yielded another large number of fish and all but a few being over the 14” mark. My largest brown, cut, and cuttbow, as well as my only bull all came on this momentous day, a day not soon to be forgotten. We returned back to the lodge for our final night and were once again amazed at the hospitality and talent of Keith and everyone else at the lodge. After our meal we said our goodbyes and thanked them for one of the greatest weeks of our lives. There are experiences in life that one will always remember for the people, places and thrills enjoyed and our stay at the Blue Damsel Lodge was undoubtedly one of them. I cannot recommend the Blue Damsel enough and I can never thank them enough for the opportunity to enjoy the beauty of Montana in with such class and care. Like this season, we’re a little late in “shaping up” and getting on track with our blog. Until a few weeks ago, we really didn’t know what to say and since then we’ve been busy gathering research (fishing). Our rivers really started dropping and clearing a few weeks ago-finally. Most of our waters have been fishing well the past few weeks and are really coming into shape right now. This has been a long time in coming. Being cautious about the record snowpack, we booked our first fishing day this summer for June 21st, which has always been safely late. This crazy year, that was not even late enough for consistently good fishing on local waters. Everything was still running high and muddy. Fortunately the Missouri was fishing great and the Dearborn was fishing very good with good clear flows and good dry fly action. By our opening, we also would have either the Blackfoot or Bitterroot come into shape for a few days so no one had to make back to back trips all the way to the Missouri. All of our guests rolled with the flow, had some good fishing and caught some big trout. Both the Blackfoot and Bitterroot fish well in high water, if you know what you are doing, which our Blackfoot River Outfitter guides do so they have been pulling it off on those rivers for a month now. 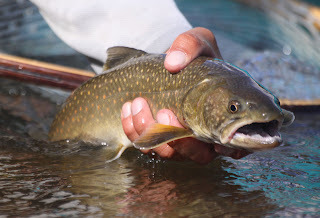 It has mainly been streamers and San Juan worms in the willows, but it has produced some big trout and, on the Blackfoot some non targeted bonus bull trout. Rock Creek has been flowing clear for about 3 weeks now and fishing very well with fish taking golden stone patterns and stimulators, as well as a broad variety of nymphs. Finally flows have dropped enough for wading the creek. The Bitterroot has had intermittently good dry fly fishing for a few weeks and is really looking good right now. And for the same few weeks the Blackfoot has gotten that still-cloudy-but-emerald green look that produces big trout. Thank you again for a wonderful stay at the Blue Damsel Lodge! As seen in the attached photos, we had an awesome trip!! Can’t wait to come back, 51 weeks and counting!! Keith was able to get out on the lower Blackfoot for the afternoon on the 21st and trout were looking up and crushed a golden stone pattern all afternoon. Nice! In addition to quite a few goldens in the air, hoppers have grown to about 1 inch and there were still salmon flies in the air. In fact, fly shops are reporting it as a salmonfly hatch on the Blackfoot-on July 23-unbelievable! The Clark Fork has started to get some good color in the past few days. We’d fish it, but why, with the Blackfoot and Bitterroot getting better each day? The bottom line is, it’s been a long time coming, but flows on all our western Montana rivers have dropped and cleared. Fish are hungry and insects are hatching. Runoff is finally over and it’s just going to get better. It certainly seems that we are assured of good, cold flows all season and correspondingly good hatches and dry fly fishing. Call us or e-mail about the few remaining dates we have openings this season. We wrapped up our short pre-run off spring season with some great dry fly fishing. The whole month of April was intermittent cloudy weather in the 40s and 50s (and good mayfly hatches) , or sunny in the 60s with some really great skwala hatches. Here is guide Adam holding David’s nice rainbow, on a very nice sunny April day with a great skwala hatch going on. Who says it’s cold in western Montana in April? We had 14 guests stay and fish with us this spring and everyone got into some very good sized fish. Thats what spring fishing in western Montana is all about! After this big spring runoff, we will be in full swing again in late June. Expect frequent posts through out the summer and expect some very good fishing reports. This is really shaping up to be a great water year. Hope to see you here. Our first guests of the season arrived on April 6th and fished their first day on April 7th. Here is Jim with his classic steelhead grip on a nice rainbow. He had two good days and one not-so-good day, but caught two big fish that day. Bruce had three great days on the Bitterroot. The skwalas weren’t really hatching for these guys and the air temps were in the 40s and low 50s. We were glad to see that. Warm weather bumped everything up two weeks ago and this is dropping everything back down. The Blackfoot and Clark Fork ars still a little off color, but should come into shape any day. Clear skys and sunny day time temps in the mid to high 50s are predicted for the next week. Fish on! Chef Josh has added some wonderful new items to the menu, including a classic Boeuf Bourguignon, a seared duck breast, and some amazing new appetizers. yum! We are off to a great start and hope to see you this season. Stay tuned for more reports real soon. We are one month away from our first guests of the spring and are very excited about how well things are shaping up for a wonderful season. The great news is that it has been snowing since October in western Montana and we have a record snow pack. We feel assured of good, cold flows all season. 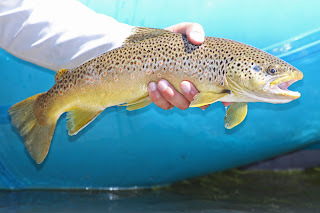 And that comes on top of two previous good water years, so we are really expecting a lot of good healthy, hard fighting wild trout all season long. We still have availability, and availability and cost, both ours and airlines, aren’t going to get better, so what are you waiting for?The whole lodge is available for a few dates, and you can book the whole lodge with a minimum of 8 guests. Of course we are booked full for some dates, but, if you are somewhat flexible on arrival, we can accommodate small groups, couples, and solo anglers during any month of the summer season. (If you are a solo angler, ask us about what we can do for you this season) We are just now entering our busy booking time, so there is no better time to get in touch with us about a fishing trip this summer. And, we still have availability for a few anglers this spring (just about anytime between April 6 and April 20), but please contact us about that right away!We hope to see you at the Blue Damsel this year. It’s probably going to be the best season yet. The streamsides are now crimson and gold and the flows are slick and cold. Bighorn rams are butting heads and guides without trips booked are bow hunting those rutting bull elk.. And the Blue Damsel check in file for 2010 is now empty, meaning the last of our guests for this season have come and gone. It has been a great season for us all, staff and guests alike. Some great meals, fellowship, fishing and memories for everyone! And we had quite a few “firsts”. We saw some guests catch their first trout and some catch their biggest trout. We had some folks play music along with us at the campfire for their first time and we took our friends from France to their first rodeo. Fishing has been good and the weather has been great. It is supposed to be overcast, rainy and cool next week so good dry fly fishing should return then. We enjoyed the fall weather last weekend for the staff and family blowout end of season party. Keith is doing a little more fishing and some grouse hunting before he heads back to Texas for the winter. Thanks to everyone for a great season. Over and out for 2010! Pictured are angler Dawn Olson and guide Mark Elliott with Dawn’s Big ol’ Big Blackfoot cutt-bow. 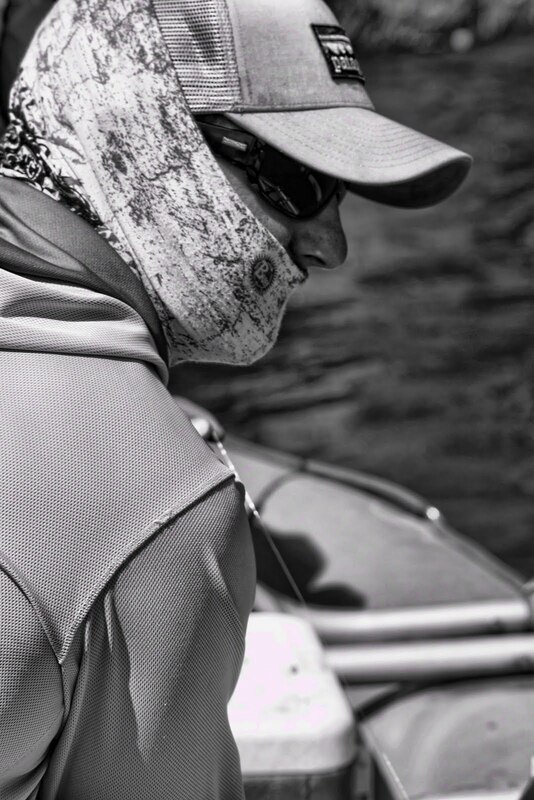 Dawn’s husband, Chris, says their 3 days provided some of the best fishing they have ever had. Hoppers are still out but fall is in the air and water temps, mayfly hatches, and trout are responding. It is hard to believe we are already into this final fall phase of our season. Like most of this season’s guests, our good friends from France, Rene-Louis and Marc have come and gone. Josh continues to amaze with his meals and presentation and the fishing has really, all in all, been great all season. The lodge is full for the next two weeks with two back to back repeat groups and then there is availability from September 21 through Oct 3. We are looking forward to about one more month of great fishing and fun before we shut down for 2010. What a great year, thanks to all of you who have come out to fish and stay with us.